If you want to experience two European countries at the same time, travel to Strasbourg, France. The capital city of the Alsace region in eastern France, Strasbourg is situated directly on the border of France and Germany. You won’t have to worry about finding a good hotel here because we can compare prices and find you the best deals in Strasbourg. Grande Île, the city’s beautiful, well-preserved historic center is what makes Strasbourg a favored tourist destination. Here, you can stroll among charming streets lined with shops, museums, art galleries and a blend of both French and German architecture featuring signs in both languages. The city’s star attraction is its glorious Gothic cathedral, which features gems like pink sandstone, intricate wood carvings and an impressive astrometric clock that is 300 years old and still working. While visiting Strasbourg, be sure to wander around the city’s most picturesque neighborhood known as La Petite France. This riverfront district is like a page out of a storybook with its cobblestone streets, pretty cafes and half-timbered buildings adorned with window planters of multicolored flowers. Strasbourg is home to several important European organizations such as the European Parliament, which offers a beautiful park and garden zone where you and your children alike can relax, play in a playground and visit a zoo. Strasbourg’s arts and culture scene is second to none. The city is overflowing in renowned art galleries, museums and theaters that include the Museum of Fine Arts, Museum of Applied Arts and the Archaeology Museum. At the Alascien Museum, you can learn all about the daily lives of the Alastian people down through the centuries through art works, artifacts and objects like tools, clothing, furniture, toys and religious relics. The L’Opera National du Rhin is a stunning opera house of Baroque architecture where you can enjoy stellar productions. You will find a lively nightlife and entertainment scene in Strasbourg with pubs, nightclubs and dance halls in nearly every neighborhood. If you visit Strasbourg in the summer, you can enjoy a number of free concerts, ballets and operas hosted by the local cultural venues. Summer also presents film and music festivals. In November and December, the city holds the oldest Christmas Market in France. If you can visit during this time, you can find a bargain among the oodles of handicrafts and other merchandise. During these annual events, you can also sample some of the city’s delectable cuisine that features a mixture of French and German dishes like sauerkraut with sausage and a meat and vegetable stew called baeckeoffe. 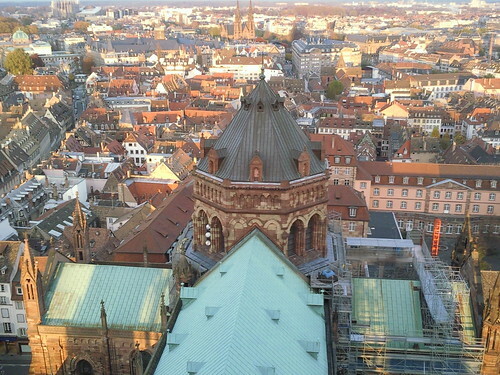 No matter what time of year you visit Strasbourg, you will most likely experience mild weather. Summers are warm but not too hot while winters can be chilly but seldom below freezing. Rain is distributed throughout the year. If you can’t wait to visit Strasbourg, you can begin your trip today by allowing us to compare hotel prices for you and finding you the best deals available online now.